Wonder what that unforgotten space might be? Well did you guess your garage? When we want to bring some order to our environment, our focus is usually inside our living space … or our home. We tend to leave our garages unattended or forgotten. So let me ask you? Do you place one or both of your cars inside your garage or do they park themselves in your driveway? If you answered yes, would you like to get one or both of them back inside the garage? Being that it’s springtime, it’s a great time to get out there and bring some order to that unforgotten space. So let me ask you? What is the function of your garage? Well our garages can become cluttered, dirty, and not very functional if we don’t follow a few guidelines. Be sure to not allow your garage to be an overall “catch all”. You know the place where we put “junk” because we don’t want it in the house and we aren’t even sure we want to keep it … but just in case. So we toss it in the garage. Hence it because our junk room. So take a look at some of these tips and see where you can apply them to your “unforgotten space”. 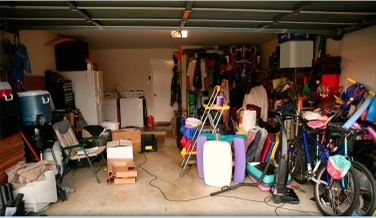 Use boxes, bins, hooks, and shelving to get items off of the garage floor. Utilize rafter space for storing less frequently used or seasonal items. If you are forever unsure of how far to pull a vehicle forward into the garage without hitting the lawnmower, take a thin rope and attach a tennis ball to the end. Hang it from the rafters at a level where the windshield just touches it when you pull forward the proper distance. Keep your bagged supplies such as fertilizers, manure or salt for the winter in plastic tubs. This way if the bag tears, you won’t have a mess or poisons scattered on your floor. Paint colorful lines on the garage floor to signify kids’ parking spaces for their bikes. Keep sawhorses and a sheet of plywood handy for easy to store and assemble workstations. Whether you are a serious carpenter or only use tools occasionally, storing your tools properly will make whatever jobs you tackle easier. Be sure that your flammable liquids such as gasoline, paint thinner and cleaning supplies are stored in tight containers and out of reach of children and animals. Be sure your children’s toys are stored on a low level and easy to reach for the little ones. Label all containers that are not clear so you can easily see what is stored in them. Want to hang your tools on a peg board? Outline each tool with a Sharpie and they it will be clear where it should be placed back when done being used. Also a good visual to see when a tool is missing. Sort your tools by function and size. Gather tool accessories and keep them with their mates, such as drills and bits. Install heavy duty hooks and secure hanging tools with bungee cords. Store power tools off of the ground in sealed cabinets or containers. If the tool has a cord, use heavy twist ties to keep the cord in a tidy loop. Invest in stationary plastic drawers for small parts, tools or garden supplies. Of course, don’t forget to toss! Toss those items you haven’t used, probably won’t use or don’t want any longer. To the garbage they go! So off you go to get that garage of yours in “tip top” shape. Happy Organizing! Your Organizing Expert …. Believing in You! Sign up to be part of Regina’s Revivers. Each month you will be encouraged to transform your home and your health! Copyright Regina Sanchez © 2019 All Rights Reserved.